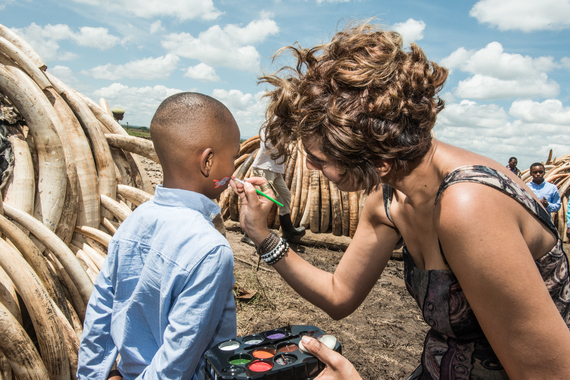 Photograph by Mia Collis, KWS from the Ivory Burn pyres in Nairobi of me painting a young boy's face with the "Elephants Aflame" symbol. If we were to compress geological time in to 24 hours, human beings would have manifested only a second before midnight. We, as a species, have had all this impact within that second. We are, but a small blip on the giant radar of life, but our imprint on this planet is as pronounced as the meteor that caused the dinosaurs to go extinct. Perhaps in growing aware of our impact, we can consciously choose to make that impact, positive. Wild is where we come from, wild is who we are, and wild is how we will continue to thrive. We had no part in its conception but we play every part in preserving it for future generations! We need to feel a part of this intricate pulsating web, not apart from it. I certainly do, and all my creative expressions evoke this truth, that degrees of separation are actually degrees of connection. 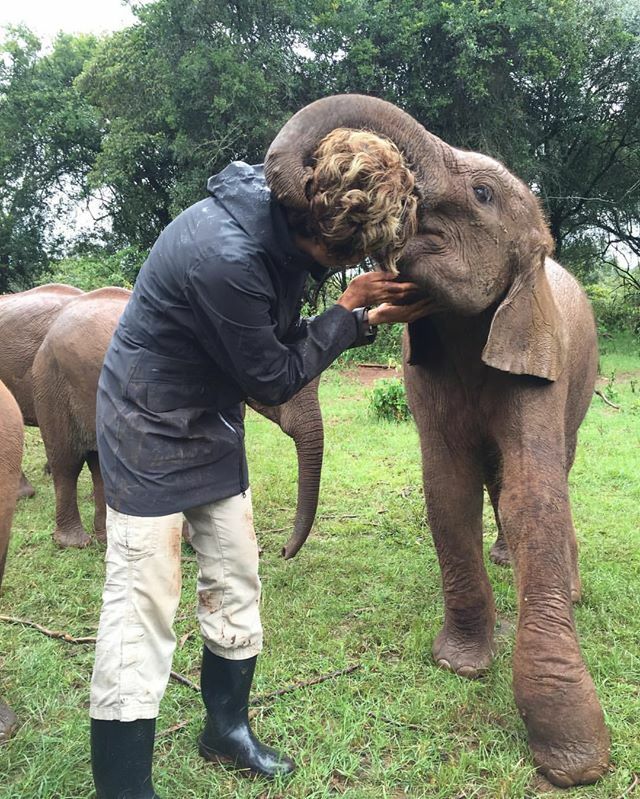 Photograph of a baby elephant at the David Sheldrick Wildlife Trust mistaking my head for a coconut and swallowing me into a black out kiss. When we poach, cull or slaughter wild for short sighted monetary gain, we interrupt and inhibit the osmotic dialogue between all living things that transcends our linear comprehension of time; we create breaks in what is otherwise a continuous, complex and cyclical biological narrative. 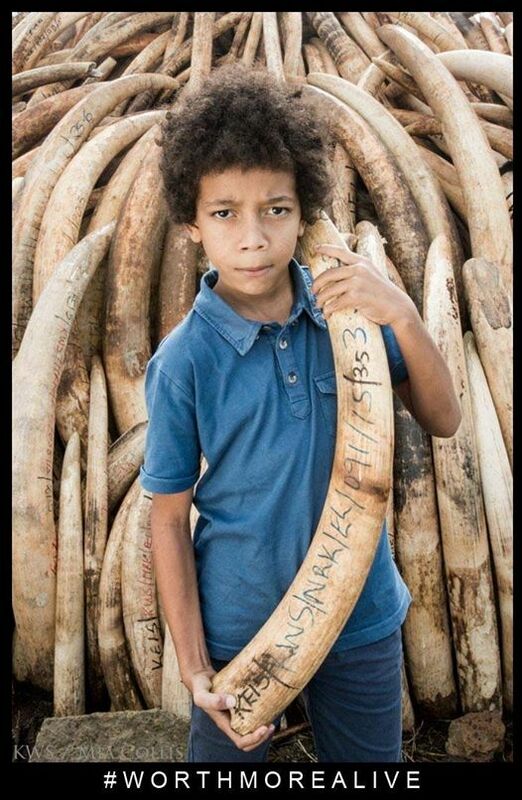 This is particularly evident with the trade in blood ivory and rhino horn, which has crippled herds of these magnificent, irreplaceable animals across African nations. It is for this reason that Kenyans needed to light a fire to their stockpiles of death. When we monetize death, and fund life with it, we can only perpetuate more death in this world, because that's what we have prioritized and assigned value to. We need to tilt this model on its head and monetize life. This monumental burn not only underscores the need to put illicit wildlife products beyond economic use, but to stop depositing death in to bank accounts. Information is a catalyst for change. Knowing evolves your engagement. The more I know today, the less I want tomorrow. When you know that an elephant is worth 76 times more alive, it makes little sense to slaughter one for a commodity that has no legal market anyway. Knowing reforms a person's purchase perspective. Time and again, we buy into choices at a price that does not account for the product's real cost. We buy because we are desperately trying to assimilate the world external to us, to make our selves bigger. What we need to recognize is that we are already all encompassing, because the world external is already a part of our biological lineage and story. All we need to do to expand ourselves is to reconnect to our wild past. If our internal landscape was aware of its origin story, we would not continue to denude the external landscape, because we would understand the external as an extension of the internal. So as a generation we need to change our priorities, our value system, economic paradigm and how we each impact the world with our daily choices. We each have impact on the world around us irrespective of our awareness of it. This is why every household and every individual in it need to be conscious consumers. Original artwork by Asher Jay, "Fueling Life with Death". The greatest change we can evoke is to move away from our antiquated obsession with ownership and the need to amass personal wealth at the cost of collective welfare. We operate from deficiency instead of contentment, we are insatiable in our wants, and avaricious in our take. In recognizing we have one finite planet, and we are one people inhabiting its various ecosystems, we might be encouraged to bring our fences and walls down and open up our borders to embrace those in need. We need to cultivate the humility to concede that the boundaries, and caps we impose on the natural world, stem from a limited understanding and the humanity to facilitate the necessary shift toward coexistence. 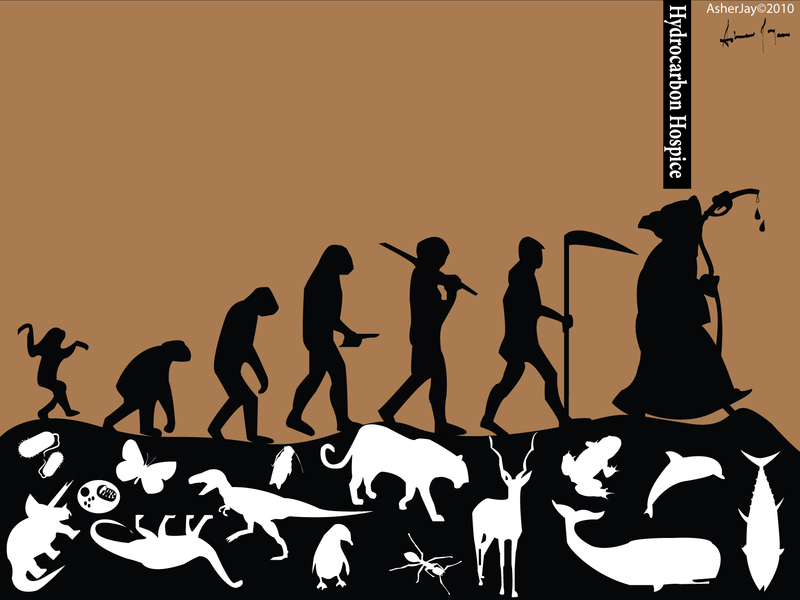 The good news is that the current paradigm is not the only way to be. I encourage YOU: the young, the able, the determined, the brave, and the compassionate visionaries of the era of change, to redesign our flailing system, economically, politically, financially, spiritually, psychologically, culturally, socially and ecologically. We need to put the long haul welfare of the collective ahead of our own immediate gain. I am not going to preach formulas of success or advocate a single strategic way to embrace a wild, inclusive future. On most days I have not a clue as to how to channel my creativity toward impact, but I wake up and I spend hours hacking away at various issues that affect me on a personal level. If you do not take responsibility for the world around you, who will? If you do not decide to fix a failing framework who will? Only when you own a problem will you feel the need to resolve it. You cannot come up with necessary answers unless you take it upon yourself to ask the right questions. Hope without understanding, seldom evokes action or enables a solution. We cannot simply hope for a better way forward, we cannot simply hope we will change. We need to apply ourselves, we need to assume responsibility, find a better way forward today, and enact change now. So here's to now, and the possibilities it holds, here's to the dark past that delivered us to this monumental burn, and here's to the future that will see us evolve from the ashes of this action. 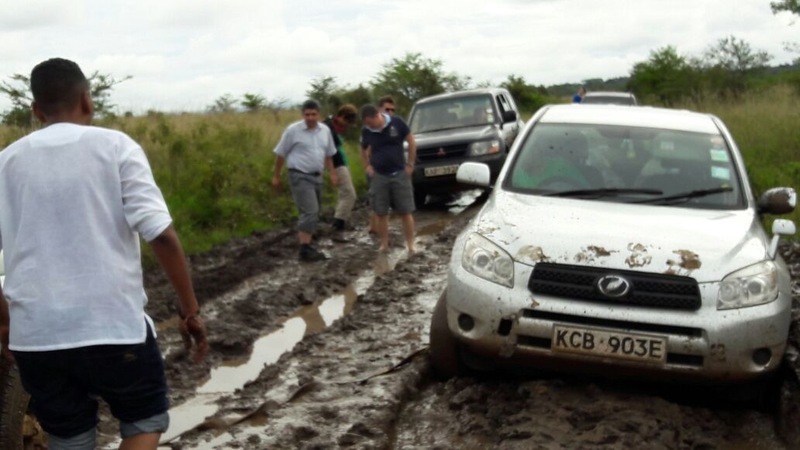 Stuck in the mud, in Nairobi National Park during the rains in April 2016 with Paula Kahumbu. My wisdom to you is mud. Luscious, wet, viscous earth. Nairobi has an abundance of it, particularly at the burn site. Go dig your toes into it, let your feet wallow in the ground, be present and reconnect to the very source of life, the planet. This is one better than the best virtual reality in the world, it is the most you can indulge your senses, and as you step into the mud, consider the imprint your life is leaving upon this finite planet. Irrespective of your awareness of your imprint, you still leave one behind, so choose to make it positive. Don't just hope, act. Be unafraid. Make your mark now.